Gettin' by on make-do in a holler in the mountains. Daniel Boone was born in a log farmhouse east of Reading Pennsylvania on November 2, 1734. Here are some free e-books for learning more about this great American frontiersman. 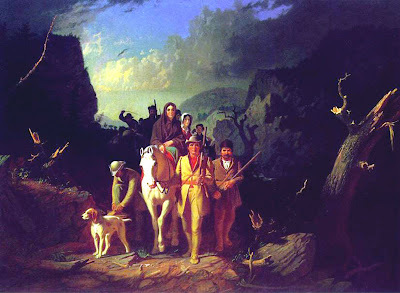 by John Filson was originally published on Daniel Boone's 50th birthday and claimed to be written in Boone's own words. It was actually written by John Filson, though Boone, himself, noted every word to be true. 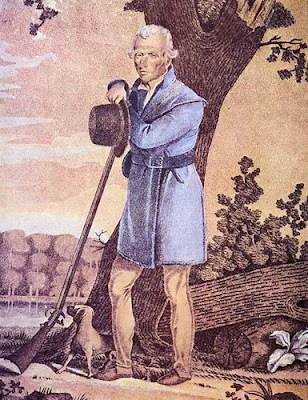 "Biographical Memoir of Daniel Boone, the First Settler of Kentucky" by Timothy Flint, is another biography of Daniel Boone, although greatly exaggerated. This book is where the tall tales about Boone come from. William Henry Bogart chronicled much of Boone's life in "Daniel Boone and the Hunters of Kentucky", originally published in 1854. The "Boys' Book of Frontier Fighters", by Edwin Legrand Sabin, was originally published in 1919 and contains tales of Daniel Boone, Buffalo Bill, Kit Carson and many other famous frontiersmen. "Indian Tales for Boys , or The Back-woodsman and True Stories of the Frontier", by Walter Whipple Spooner, is another adventure book written for boys, published in 1883. It contains many stories about Daniel Boone and other frontiersmen in our nation's early Western history.